Compliment vs. Complement: What’s the Difference? Home » Compliment vs. Complement: What’s the Difference? Compliment and complement are right alongside other English homophones such as there, their, and they’re and to, too, and two. Homophones are words that, despite sounding identical, actually have different meanings. What is the Difference Between Compliment and Complement? In this post, I will outline the differences and definitions of these two words. I will go over the functions of each word and use example sentences to show how they are used in real-life sentences from newspaper outlets and print journals. What does compliment mean? Compliment can function as both a noun and a verb. When used as a noun, a compliment is a flattering or praising remark. What does complement mean? Complement can also function as both a noun and a verb. It denotes completeness or the process of supplementing something. When used as a noun, a complement is something that completes or brings to perfection. Don’t think you will be able to remember all of this next time you are picking between complement vs. compliment? Here’s a useful mnemonic that will be able to help you through those times of indecision. A good way to remember the difference between these two words is to remember that “I” make compliments to other people. “I” make compliments about people’s clothes and compliment has an “i” in it. So is it complement or compliment? That, of course, depends on the context of your sentence. Each word has is own purpose and function. A complement is something that completes something else or brings it to perfection. A compliment is a polite expression of praise or admiration. 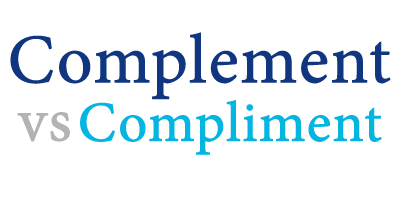 1 What is the Difference Between Compliment and Complement? Capital vs. Capitol: What’s the Difference? Aloud vs. Out Loud: What’s the Difference?